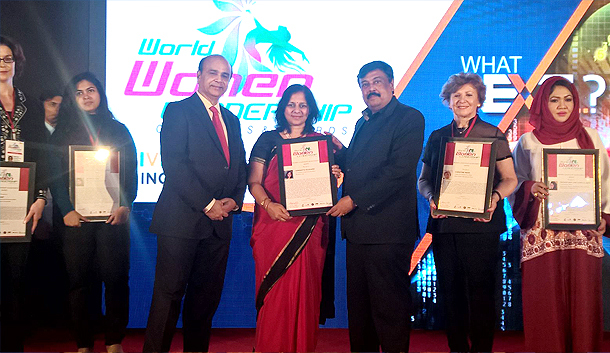 WWLCA (www.worldwomenleadershipcongress.org) identifies and celebrates outstanding leadership and achievements showcased by women leaders who are identified by their distinct innovations and initiatives in private, public and philanthropic sectors. 1. Nina Woodard, SPHR, GPHR, MBA, President and Chief "N" Sights Officer, Nina E Woodard & Associates, USA. 2. Dr. Arun Arora, Chairman, eDvance Learning Systems (Ex-President – Bennett Coleman and Co. Ltd. - Times of India). 3. Michael Wong, Co-Founder, Thought Leaders International. 4. Dr. Saugata Mitra, Chief People Officer & Group Head HR, Mother Dairy Fruit & Vegetable Pvt Ltd.
5. Dave Porter, Global Chairman, World Brand Congress. 6. Jonathan Peters, Founder, Stars of the Industry Group. 7. Priti Vyas, Chairwomen, VGC (Vyas Giannetti Creative). 8. Dr. Harish Mehta, Chairman and MD, Onward Technologies Limited and Founder Member, NASSCOM & Onward Foundation. 9. Dr. Chandramauli Dwivedi, Director, N. L. Dalmia Institute of Management Studies & Research. 10. Andrew Kelly, Chief Patron, CMO Asia.